Antonio Jacobsen was a born in Copenhagen, Denmark, and came to New York in 1873 apparently with the intent to become a ship portrait painter, an ambition he achieved with remarkable success. During all but his last few years, Jacobsen enjoyed a comfortable lifestyle, which reflected the financial success of his life’s work. Jacobsen deserves the dual title of marine historian and marine artist. His clients- mostly ship’s officers, crewman and owners demanded accuracy –and accuracy was what they received. 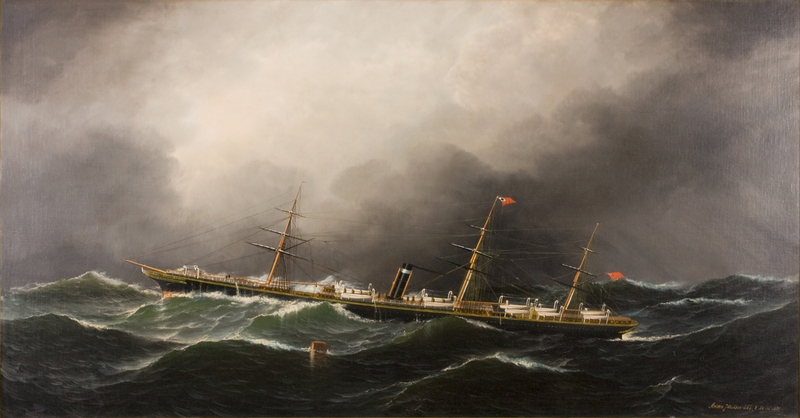 He chronicled the transition from sail to steam and the full commercial magnetism of the port of New York. He was a prolific painter with over 2400 known works extant. The artist home in Hoboken, New Jersey, was a Mecca for seafarers and artists, including Fred Pansing, James Buttersworth, F. Bishop and Frederick Cozzens. On Sundays, Jacobsen would arrange concerts, at his house, he and his friends playing chamber music. Many tales exist regarding the artist’s personality, electric interests, and artistic methods- including his improvidence, multi-linguistic and musical talents, voracious book reading and collecting, and the utilization, late in his career, of his two children to paint the backgrounds in his work. Works by Antonio Jacobsen can be seen in the most major collections of marine art. Two of the most extensive public collections are the Mariner’s Museum, Newport News, Virginia, and The Peabody Museum, Salem, Massachusetts. The iron screw steamer Aguan was built in 1886 by Duncan and Co. of Port Glasgow, Scotland for the Honduras and Central American Steamship Company. She measured 1618 tons, 235.8 feet in length, 35.0 of beam, and 18.5 feet depth of hold. Her Homeport was Glasgow, Scotland. She was engaged in the fruit and general cargo trade between the British Isles and Central America. She disappeared from the shipping registers in 1891.